I did this drawing using Inktense watercolour pencils. 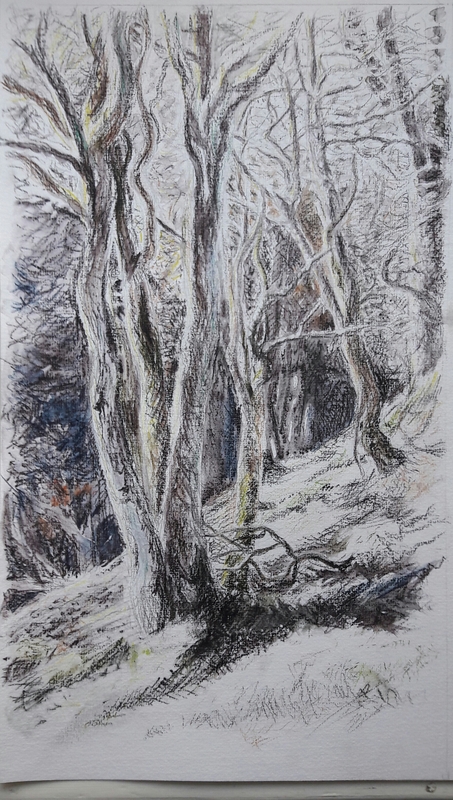 I took photos of the woodland and then drew from the one I liked best. All my drawing was done indoors from a photo as it was too cold to sit outside. I tried to summon up the feeling of looking into the woodland as I drew. The drawing is on A3 paper but I drew a new page onto this as it is proportionately longer compared to standard proportions. I drew on thick watercolour paper which was good for tolerating the use of water. The drawing took about 5 hours. I wanted to experiment with the colour pencils as I haven’t had a lot of experience drawing in colour at all and especially with these pencils. I like the quite vigorous pencil marks in the drawing. Drawing into water created especially intense, dark, strong marks. I think the composition is quite interesting with the slope of the ground and the deep shadow forming a triangle behind it. One thing I don’t like about the pencils is it is hard to rub out or lift the colour. The shadow in the foreground is slightly too dark but I couldn’t change this. If I did this exercise again I would do some quick sketches to explore composition and tone before deciding on the final composition. I’d also like to think about how to produce a satisfactory drawing in less than 5 hours!